New Directions Publishing Corporation, 9780811216098, 279pp. A novel of awesome beauty and power by the Hungarian master, Laszla Krasznahorkai. Winner of a 2005 PEN Translation Fund Award. 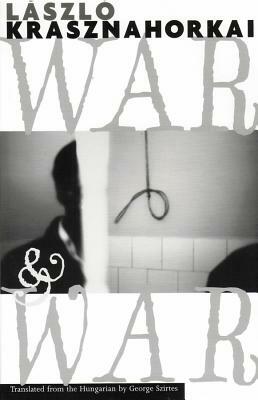 War and War, Laszla Krasznahorkai's second novel in English from New Directions, begins at a point of danger: on a dark train platform Korim is on the verge of being attacked by thuggish teenagers and robbed; and from here, we are carried along by the insistent voice of this nervous clerk. Desperate, at times almost mad, but also keenly empathic, Korim has discovered in a small Hungarian town's archives an antique manuscript of startling beauty: it narrates the epic tale of brothers-in-arms struggling to return home from a disastrous war. Korim is determined to do away with himself, but before he can commit suicide, he feels he must escape to New York with the precious manuscript and commit it to eternity by typing it all on the world-wide web. Following Korim with obsessive realism through the streets of New York (from his landing in a Bowery flophouse to his moving far uptown with a mad interpreter), War and War relates his encounters with a fascinating range of humanity, a world torn between viciousness and mysterious beauty. Following the eight chapters of War and War is a short "prequel acting as a sequel," "Isaiah," which brings us to a dark bar, years before in Hungary, where Korim rants against the world and threatens suicide. Written like nothing else (turning single sentences into chapters), War and War affirms W. G. Sebald's comment that Krasznahorkai's prose "far surpasses all the lesser concerns of contemporary writing.